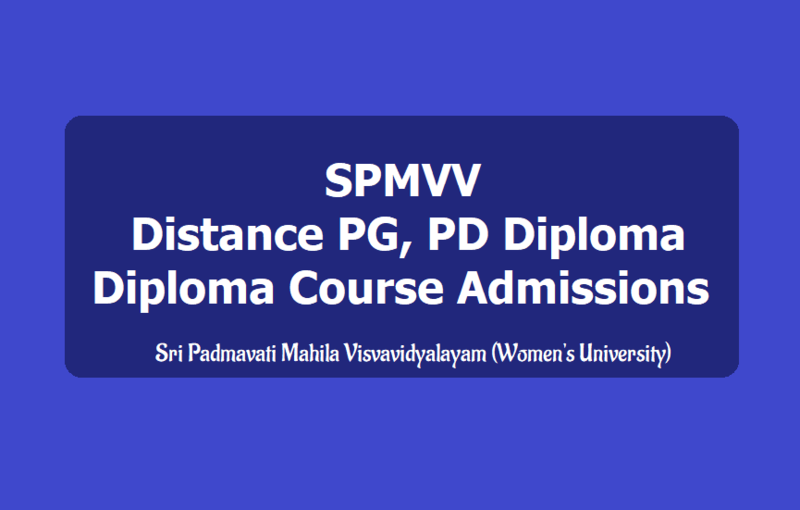 Women's University Distance Courses Admissions 2019, Sri Padmavati Mahila Visvavidyalayam Distance PG, B.Ed and Diploma Courses admissions 2019. Sri Padmavati Mahila Visvavidyalayam, Tirupati Directorate of Distance Education has given PG, B.Ed, PG Diploma, Diploma Courses and Certificate Courses Admissions 2019 notification and applications are invited from eligible woman candidates for admission into PG/ B.Ed./ PG Diploma/ Diploma/ Certificate Courses. SPMVV, DDE - PG, PG Diploma, Diploma Courses: Sri Padmavati Mahila Visvavidyalayam, Directorate of Distance Education invites applications from eligible women candidates for admission into following PG, PG Diploma, Diploma courses. The Centre provides higher education to women through distance mode making them self-reliant. The Courses serve the purpose of extending academic excellence, orientation and motivation to the students for creative interaction with the society. a. PG COURSES: M.Sc Mathematics, Zoology, Master of Commerce, M.A Communication & Journalism, Economics, English, Telugu, Music and Women’s Studies. c. DIPLOMA COURSE: Music (Sankeertana, Varnam, Annamayya Antarangam). M.Sc Mathematics, Zoology. M.A English, Telugu, Music and Women’s Studies. LL.M- Constitutional Law & Administrative Law. Master of Business Administration in Entrepreneurship/ Information Systems/ Human Resource Management/ Financial Management/ Production Management. 3. P.G. Diploma Courses: Family & Health Counseling, Pre-School Education, Public Relations, Office Administration. 4. Diploma Courses: Music, Office Administration. 5. Certificate Courses: Office Administration, JAVA, Advanced JAVA and C++, C Language. a) Degree/Provisional Certificate of the Qualifying examination passed. the other to be enclosed). e) Crossed Demand Draft (Original). f) Certificate of proof of date of birth. g) Identity Card duly signed and photo affixed (Original). h) Three address slips duly filled – in. Candidates have to apply to Directorate of Distance Education, Sri Padmavati Mahila Visvavidyalayam from 01.01.2019. Admissions will also be done at study centers. Last date for submission of application: 31.03.2019. Sri Padmavati Mahila Visvavidyalayam being the only Women's University in the state realizes the significance of the need and intends to offer Higher Education Programmes in the mode of Distance Education exclusively for women covering the entire state with the its Goals and Objectives.